I recently purchased a new desk from Target after my old desk broke. I’m absolutely obsessed with this desk and how functional and simple it is. 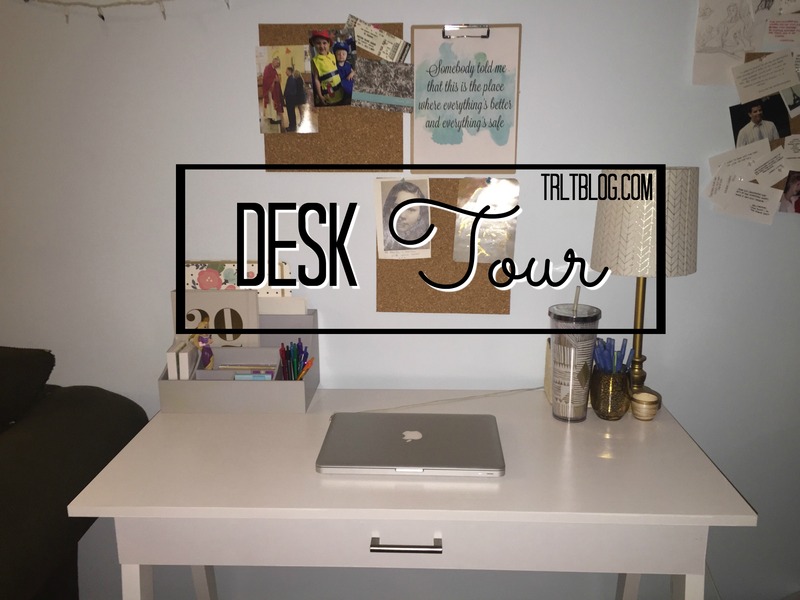 I thought it would be fun to share what I have on and in my desk for some inspiration! On top I keep a few things. My laptop of course! I always have my tumbler of water from Starbucks with me. I also have a little vase from TJ Maxx that stores a lot of my washi tape. Next to that is a pen holder from Target that holds my absolute favorite blue pens and a highlighter. And I also have a small candle holder with light blue paper clips found in the dollar spot at Target. These are some essentials I like to have at easy reach. To my left, I keep a small desk organizer that I bought from Home Goods with some more desk essentials I always find myself reaching for. In the back I have a few file folders from Home Goods and they are absolutely stunning. I also keep my planner, notebook, and journal in here because I’m always planning, making lists, and trying to brain dump. Then I have a Pride and Prejudice Book because I’m currently reading it for school. In the smaller compartments I have index cards, the pens I use to color code my planner, sticky notes, my fitbit charger and my favorite Rapunzel pen I bought in Disney! Above my desk are two cork boards and a clip board with a quote I made on Pic Monkey. The quote is from One Tree Hill, if you’re wondering! And I plan to switch that up often. Right now I just have a pictures on the cork boards but once I get important school papers those will probably be hung up too. Inside the drawer holds a lot of my extra stuff. I have tons of pens and pencils in here and I keep my favorite Staedtler Fineliner pens in their case in here. But these will probably get moved to my grey desk organizer soon. I have my hard drive, sticky notes, my ipad, a calculator, more index cards, scissors, my class notebooks, and a mini declaration of independence/constitution! I really love this desk and would definitely recommend it to anyone. For the price and quality, you really can’t beat it! Plus it comes in other colors too! What are some of your desk necessities? I’m always looking to buy more desk supplies/decorations/stationary!